Recent research shows eating berries may protect against mental decline. Glorious blueberries, sweet acai berries, luscious strawberries — new research shows they may boost your aging brain. As we get older, damaged cells accumulate in the brain, which can lead to age-related diseases such as dementia, Alzheimer's, and Parkinson's. That's where berries come in. 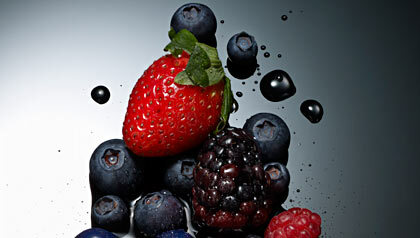 Polyphenols, which give berries their deep-red or -blue hue, activate proteins that "clean up" damaged cells, breaking down and recycling the toxic chemicals linked to age-related mental decline, says study author Shibu Poulose, Ph.D., a molecular biologist with the U.S. Department of Agriculture's Human Nutrition Research Center on Aging in Boston. Scientists have found the first evidence that polyphenol compounds in the fruits activate the brain's natural "housekeeping" mechanism. This mops up and recycles toxic proteins linked to the memory loss and mental decline many people experience as they get older. The US researchers focused on special immune system cells in the brain called microglia which engulf, remove and recycle harmful biochemical debris. Lead scientist Dr Shibu Poulose, from the Human Nutrition Research Center on Aging in Boston, Massachusetts, said: "In ageing, microglia fail to do their work, and debris builds up." "In addition, the microglia become over-activated and actually begin to damage healthy cells in the brain." "Our research suggests that the polyphenolics in berries have a rescuing effect. They seem to restore the normal housekeeping function. These findings are the first to show these effects of berries." The researchers studied cultures of mouse brain cells. They found that extracts of blueberries, strawberries and acai berries - a grape-like fruit from the Brazilian rainforest - blocked the action of a protein that stops microglia doing their job. The findings were presented at the 240th National Meeting of the American Chemical Society in Boston. Other fruits and vegetables contain the same beneficial polyphenol chemicals, said the scientists - especially those with deep red, orange or blue colours. These 'berried treasures' do more than help your mind: Blueberries rank first among fruits for their antioxidant powers, strawberries are tops in vitamin C, and acai berries contain high levels of omega-6 and -9 fatty acids, thought to play a role in cardiovascular health, says nutritionist Robyn Webb, food editor of Diabetes Forecast magazine. Make berries a regular part of your diet by incorporating them into healthy salads, desserts and smoothies.